So, this Saturday I’m having a little stall at St Leonard’s Summer Fete, which is held at St Leonard’s church, Lexden, CO3 4BL. It’s being opened by our new Colchester MP, Will Quince, at 11.00 am, and will close about 2.30pm. 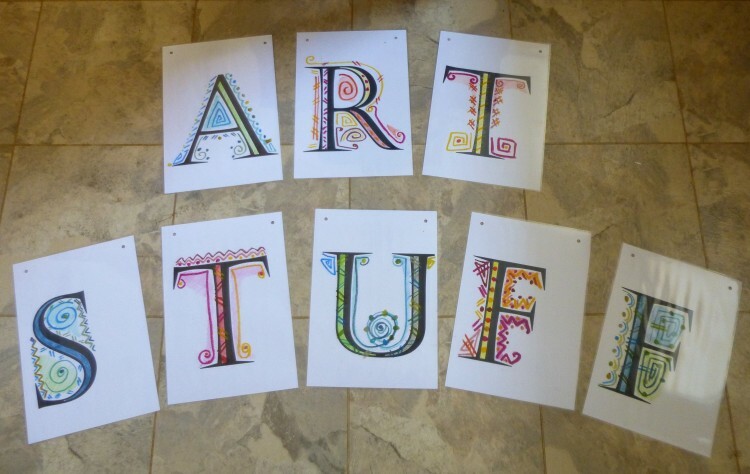 I’ve called my stall ‘ART STUFF’ and I’m made some ‘bunting’ to tie along the rail of my gazebo – it’s just card which I decorated and laminated, with holes punched in, through which I shall thread picture cord. My ‘bunting’ on the kitchen floor! I’ve stocked up on cards and have also got some completely new ones, so shall be selling 23 (!!!) different card designs, plus six designs by my niece Claire – these are the first six in her new CJB designs project, and she has some great new designs in the pipeline. I’ve also got ten different designs of the limited edition Canvas Prints, including some that haven’t launched on the website page yet. I’m not sure why I thought on top of the cooker was a good place to photograph them – I daresay it was just an available empty space . . . . .
Lots of canvas prints for sale . 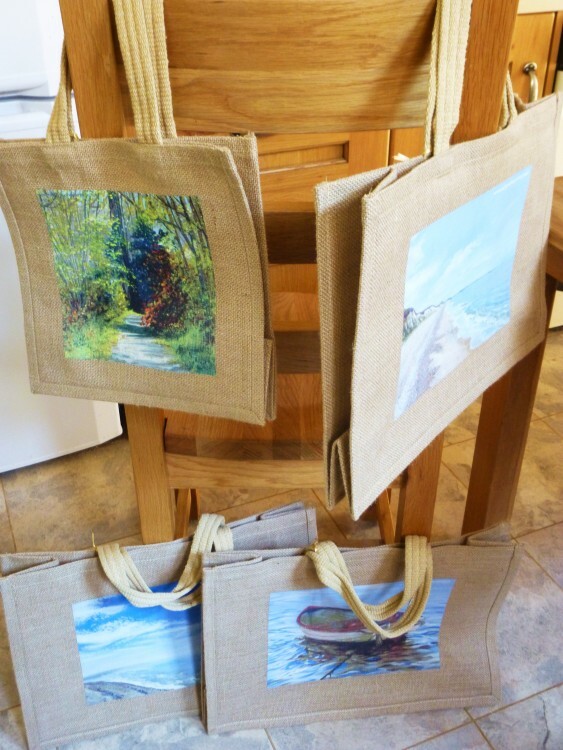 . . . .
Also, something completely new – I’ve had some Jute bags made with images from my paintings on the side. I’ve only ordered a few to start with, but I’m really pleased with the quality. 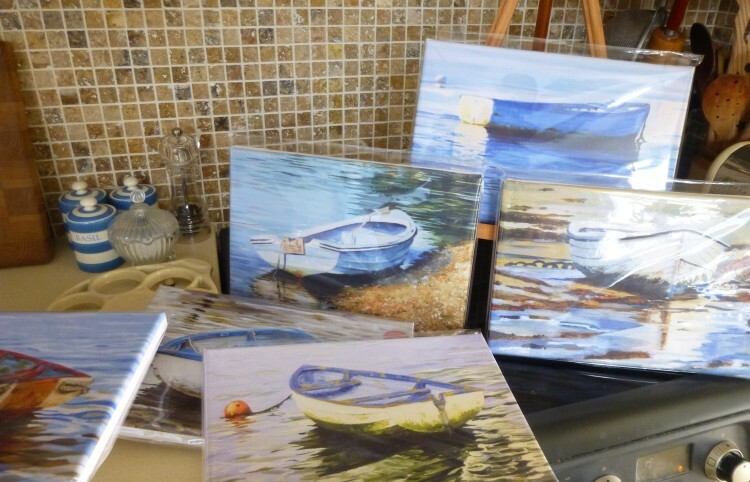 They would be great for shopping of course, but would also make lovely beach bags – two have seascape paintings on them! – or a nice useful very reasonably priced present! So, if you are around Lexden on Saturday, do pop in and say hello! It’s a lovely old fashioned summer fete, with lots of stalls and games, and a brass band, and lunches and ice cream . . . .